Did you know that you can help our animals by simply shopping online? By supporting while you shop, you can really help the animals in our care. Did you know that you can help our animals simply by shopping online, with no extra cost to you at all? Money from these shopping schemes is a real help to the animals in our care. Next time you shop with Amazon, you can help animals in need at the same time. 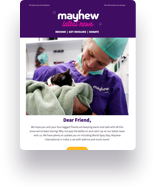 By using AmazonSmile and selecting Mayhew as your chosen charity, Amazon will give 0.5% of the product’s net purchase price to our cause. This comes at no extra cost to you, all you have to do is look out for products that are eligible for Amazon Smile. Easy Fundraising works with shops such as John Lewis and Amazon, who donate a percentage of the product purchase price to the charity of your choice. There are two ways that you can support Mayhew through eBay. Have you visited our online shop?